1 3/8 inch Kirsch designer metal Europa finials for designer metal curtain rod poles and traverse rods. 1 3/8 inch Kirsch designer metal Legion finials for designer metal curtain rod poles and traverse rods. White finish. Lockseam, triple. A Kirsch curtain rod. Mounting brackets included. Use for triple layer treatments, sheer in back, privacy curtain in the middle and a valance over the treatment. Kirsch wood trend wood rings for 3 inch diameter wooden curtain rods, 4 per bag. Wood used for curtain poles is fine grain hardwood. For wood grain look, select a stain finish. 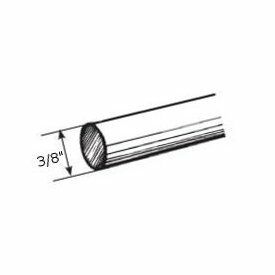 Kirsch wood trend wood ball finial for 3 inch Wood Trend curtain rods. Superfine one way right curtain rod set, 100"-180"
Superfine white traverse rods include drop in brackets, supports and cord tension pulley for installation. Includes 33 slides and 4 support brackets. Clearance 2 to 3 inches, return 3.5 to 4.5 inches. Made from heavy gage steel with a baked enamel finish. Exclusive Kirlon on all sliding surfaces. Push in brackets and extension plates are available as an option. Only the finest pulley sets are used. Strong and durable with a slide gate for easy removal of extra slides. Long wearing, stretch resistant polyester cord and continuous lacing for use at either end or to convert to a one way draw. One way draw, extends from 66 to 120 inches. Window curtain rods & hardware in white finish, includes 38 slides, brackets and 2 center supports. Two way draw, also known as center open. Kirsch drapery rods, Superfine Traverse rod set include drop in brackets, supports and cord tension pulley for installation. Made from heavy gauge steel with a baked enamel finish. Exclusive Kirlon on all sliding surfaces. Push in brackets and extension plates are available as an option. Only the finest pulley sets are used. Strong and durable with a slide gate for easy removal of extra slides. Long wearing, stretch resistant polyester cord and continuous lacing for use at either end or to convert to a one way draw. Two way draw, extends from 86 to 150 inches. Order in 12 foot increments. Extruded aluminum, white finish. Cord draw, ceiling or wall mount. For pinch pleat or ripple fold drapery systems . .
Architrac Series 94001. Use for ceiling mounted curtain rods. Projects 3 1/2 to 4 1/2 inches, includes mounting hardware, clearance 2 1/2 to 3 1/2 inches. 1 1/2 inch Black Windsor curtain rod. Drapery hardware collection by Graber. See our how traverse rod installation sheets in the support section. Select Color from drop down box. How to hang a curtain rod instructions are furnished with each rod. Brass drapery rods require cleaning, Alexandria gives you the brass look without the messy cleaning. Rods are metal, slides and finials are plastic. Projection 3 1/2 to 4 1/2 inches, includes mounting hardware.